The weather forced Kinder Morgan to announce a force majeure in Alabama and Georgia, as well as its ethanol terminal in Illinois, a fuel hub for the Midwest. Eric Rosen, the vice president of sales, supply, and trading at Papco Inc., said that “at some point you have to have the gasoline blend with the ethanol, and that line from the ethanol tank to the rack is where you see a lot of those issues where it gets frozen. And the price of gasoline shoots up, as it has done, slowing the already-anemic economy all the more. This conveys a deep truth. Getting an astronaut (Yuri Gagarin) into orbit and back to earth is an engineering problem. Human beings have figured out a way to do that that is generally predictable based on a set of mathematical equations that are testable and where the results are replicable. They are a form of applied physics or engineering. They are a problem (how do we get Yuri Gagarin back from space) that has a fairly well-specified solution. Of course that solution did not exist in 1850. But by 1961, it was solvable. Running an economy is not an engineering problem. There are no simple equations that describe its motion that are akin to the engineering problem of space travel. So Ms. Gagarin’s return is uncertain. The joke is a statement about Soviet planning that resulted in frequent shortages and long lines of presumably uncertain length. Sometimes items were in stock, sometimes they weren't. This is exactly how the redistributionists in the Obama Administration think about the economy: it is a machine, and fixing it merely involves more government stimulus and more debasement of the currency. That view is demonstrably WRONG, and it will lead to the destruction of not only the currency, but also that of civil society. I mentioned many times why it is better to be with other (close) people when SHTF then to be alone. My course where I talk in detail about my experiences in war has many situations that I would not have survived without my family. There is one other side to that, during SHTF when anarchy and fighting for survival means violence and you see people close to you get hurt or killed. Lots of people here in my country have gone through that, including me, and of course after first reactions that are common to all of us (grief, anger, sadness…) we react different. How we managed to cope with the pain, formed our whole future life, it formed us, destroyed some, and even gave strength to few. When you lose someone because of illness or old age or traffic accident, maybe you may accuse bad health system, or similar, or even God, but eventually you will say „It is life, we all gonna die, it is how it is supposed to be“. But when you lost someone close because someone shot him during a fight between two opposite groups (because they different, or because the hate each other, or just because one group wanted resources from another group) it is different. It can change your whole perspective of life. It can put lots of RAGE in you. And it is RAGE written in capitals. It lasts for years, and it can drive all your decisions, it can consume you at the end. I’ve seen (and still see) lot of people here with it. Selco, who survived the ultimate SHTF in the Balkan wars, knows what he is talking about. Should we have civil warfare in America, as many worst-case scenarios would inevitably lead us into, we would do well to consider the consequences that Selco has laid out for us here, for America is already acting like a Third-World nation. On one side of the moral equation in Alice’s Restaurant you had Office Obie and the nameless army officers who were rulebound fascists and on the other side you had the easygoing hippies who believed in community, hanging out and letting things slide. Culture would drag you into court for littering with twenty seven eight-by-ten color glossy photographs as evidence while counterculture would shrug and invite you to dinner. Just read the whole thing. As he observes, the culture and the counter-culture have completely traded places since the 60's. This is what happens when you start acting like all religions have equal merit. We were, and considered ourselves, a Christian nation for close to two hundred years, and now we have rejected that label. This is the result. One has a hard time understanding Satan worshipers. What has he ever done to deserve gratitude, respect, or worship? If you believe in Satan, you must also believe there is a God. For one was created by the other, and then that creation rebelled. One represents all that is good, and one represents all that is evil. If you choose the latter, it shows what kind of person you really are. One of my friends had this to say about the latest OMG moment in the culture wars. And that is a good point. Once we start to believe that all religions have equal validity, then this is what you end up with. History tells that this nation was founded by Christians on Biblical principles. One may not like that, but the truth is the truth. The concept of ‘freedom of religion’ was specifically designed so we wouldn't have one official church that everyone had to belong to as the case had been in Britain. But it in no way diminished or downplayed the role Christianity prominently played in society and the culture at large, both in and out of government. It is the courts, not the people or the Constitution as originally written or understood, that have attempted to remove Christianity from its historical place and role in our nation. But such politically correct, liberal ideas have led us down this path to where it would be conceivable for such a hateful blasphemy to even be considered acceptable or legal to display next to the Ten Commandments. I am going to say something here that has surprised people when I have said it in the past: I beg Oklahomans to stop this thing, or destroy it. You do NOT want this image set up in your land. God will have plenty of reason to bring his wrath upon you. You try to use the Constitution and the legal system to stop it, but if that isn't enough, there are other means. There is a higher calling than the law. The God of Israel and of Christ was very clear about idolatry, and about the worship of Satan. Do not permit this in your land, I beg you. Here's an interview (via Blasted Fools blog) with the spokesdemon, er, spokesman for the Satanist group that's trying to do this. Apparently, Oklahoma has set a moratorium on new statues, so this abomination may not happen. Bloomberg: OK, so tell me a little bit about this monument. How did the idea come about? Lucien: We have members in Oklahoma. They reached out to us and told us about the Ten Commandments statue being placed there. When the ACLU sued, the state responded by saying it had actually envisioned a monument park and additional monuments could be added. We felt that was an invitation for more statues, so we decided to donate one. Bloomberg: The statue depicts a goat-man and children. What does it mean? Lucien: ...in a way, it represents the hysterical witch-hunting fears of the past and our new empathetic drive to look more rationally at things. Bloomberg: How have people reacted to all this? Lucien: Surprisingly, the flood of support we’ve gotten far outweighs the hate mail. A lot of e-mails we get from people start out with them letting us know that they consider themselves Christian but support us on the basis of constitutional freedom. They understand we’re not assaulting them. We’re upholding our freedom to maintain a pluralistic nation where all voices can be heard and where we don’t discriminate on the basis of religion or creed. Bloomberg: What do you think about Oklahoma’s moratorium on new statues? Lucien: We haven’t been made aware of it officially. When we decided to donate a statue, we went through all the proper channels. We submitted a letter to the Capitol Preservation Commission, and they sent us back the paperwork we needed to fill out. All this happened before the moratorium, so as far as I’m concerned it shouldn’t apply to us retroactively. I’m not sure if the Hindus or PETA got in before the moratorium passed, but we did. No one has told us that there would be a change in our application status. Bloomberg: I have to be honest with you, it seems unlikely that the Oklahoma government is going to erect a statue to Satan in front of its capitol. What will you do if you get denied? Lucien: That would be then something for the lawyers to hash out. But if we fight the battle to the bitter end, and it turns out we can’t have our statue, we’ll try to place it elsewhere. We’ll move on to the next place (Obama’s Presidential Library in Chicago?). Bloomberg: So you’re willing to go to court on this? They think they are being clever atheists, but really they are nursing an enmity with God that threatens them and our nation. 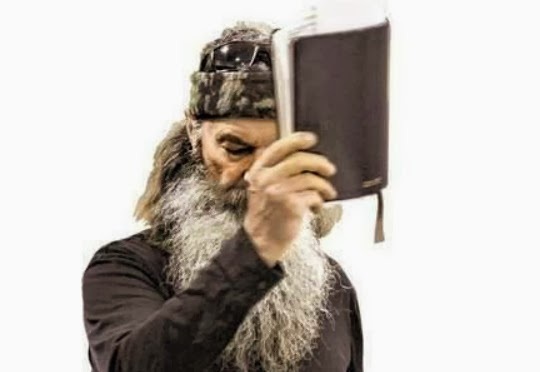 Many Christians believe the real reason Phil Robertson’s opponents reject his position on the unnatural nature of homosexuality is because his perspective comes from basic Biblical teaching. The entire article, available here, takes 10 short paragraphs to explain Huffington Post’s perspective on why they believe Phil’s views are wrong and illegitimate as a rational opinion. Yet, two days ago, the same news source gave twelve minutes of airtime to discussing the legitimacy of Satan worshipers’ proposal to erect a monument to the Devil on the grounds of the OK State Capitol. Of course. As Ol' Backwoods told y'all over the holidays, it's open season on Christians, but the Left gets to do whatever they want. America is infested with Commie garbage and those who support Commie garbage. They are facilitated even more by the rotten masses that have grown up in recent generations of moral decay orchestrated by the Commies among us. A bloodbath is coming to America not only in our lifetime, but I will dare say by November 2016, at the latest. Communists have proven many times they have no problem killing tens-of-millions of people. They mean to kill you to turn the last piece of planet Earth Commie Red with your blood, or your disease, or your famine. Or we get them first. There is no middle ground. There is no compromise. There is no parting ways peacefully. They mean to have a genocide based on political ideology. I have no problem doing the same to them, firstest and mostest. Well, I DO have a problem with it. I have the Judge of the Living and the Dead to answer to, and so do many millions of my fellow believers in America. We want to solve the problem, but we need to do this the right way, the way our Founders did. I know we have suffered the privation of almost every natural right, and almost every enumerated right in the Constitution, but I need a little more before I go out and start killing government functionaries. To do it now is a bridge too far, Mr. Kerodin. If you go full Fort Sumter, you risk being labelled as the aggressor, the terrorist, the one who started the civil war. You give the government the moral high ground, the ability to say, "Y'all started it, and NOW we're gonna finish it!" I do agree with him about his timeframe. Sauron's minions are fixing to lose the White House and Congress, and without that, the progressive commies are back to having only the Courts, the Fed and the bureaucracy to work their evil, and it isn't enough for the end-game they have in mind. They are going to have to move fast. But let them make the first move. There will be no more free Wacos, Eric Holder. No more Ruby Ridges, Lon Horiuchi, . No more Reese families. No more security theatre that does not prevent terrorist attacks (warning, language at link). No more terrorist false-flag events staged by the FBI or the ATF. No more.